Planning a Wedding trip to India? This has become a most common practice for the NRI s and even for the non native ones from abroad who are in love with Indian culture or inquisitively want to touch up their special day with some unique features. The wedding ceremony in India can be a very expensive affair but will surely be the most rocking event in your life as it has much to unfold. So, are you ready to pay and get the best? The wedding in India is getting very popular all over the world and many Foreign Nationals presently prefer to visit India and get married in the Indian style. Presently Hindu Wedding is in vogue. 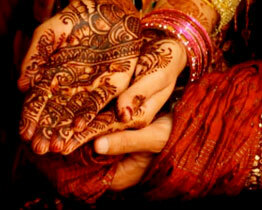 Hindu weddings are celebrated on a large scale all over the world. 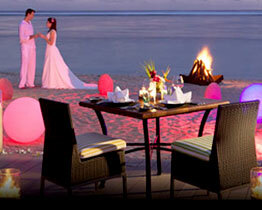 The marriage ceremony includes various pre wedding and wedding functions. The main function of the wedding takes place at the bride's place and a mandap is erected and the interior is beautifully decorated with flowers, colorful personal adornment and decorative items. Indian wedding is all about fun and feast. 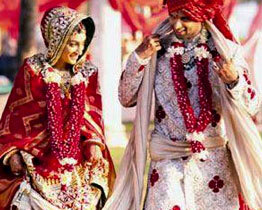 According to Indian custom the bride and groom are showered with gifts and attention. Hindu wedding (Shaadi or Vivah in Hindi) ceremonies are traditionally conducted in Sanskrit, the language in which most holy Hindu ceremonies are conducted. 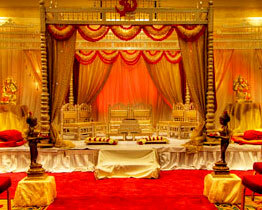 Modern Hindu weddings are often much shorter and do not involve all of the rituals of the traditional ceremony which sometimes were for 5 days. Instead certain ceremonies are picked by the families of the bride and the groom, depending on their family tradition, caste etc. The ceremony is held with the sacred fire (Agni) as the witness. 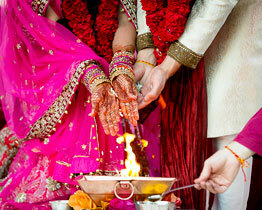 Marriages in South Indian Brahmin families are performed according to Vedic rites. In the olden days marriages used to be performed on four days. Normally marriages used to be conducted at the residence of the bride. Big pandal is erected in front of the house. It may cover neighbors house fronts and major portion of the street. The whole village used to be involved in the arrangements. Personal assistance for the bride's family used to be just for the asking. This is another social aspect. With the disposal of the family members in various parts of the world and also due to lack of space in the cities and towns marriages are conducted in Kalyana Mandapams now-a-days. Social aspects of marriages are (a) Reception by procession of the groom (Janavasam or Mappilai ashaippu) (b) Exchange of garlands (Maalai matruthal) (c) Oonjal (Swing on which the young to be married are made to sit and rocked gently.) (d) Nalangu (Passing coconut shape brass ball between the couple). Vritham- groom performs religious rites for entering grahastha asramam. These agencies will work in phases to make your Dream Wedding come true with some initial consultation with you. They will do the Budget Setting, designing Wedding package and itinerary, organizing the Vendors chalking out the finer details on every important issue and on the day coordination. According to their advices you can ask them to seek out and set up all your supplier meetings and manage your wedding on your behalf. This will also include the wedding day itself, where Weddings will be on hand to ensure that everything is running to plan on your big day.